But not, as it turned out, during our four days in Tokyo. This mega-city, Japan’s capital, was our first stop prior to a nine-day cruise around Hokkaido, the country’s northern island. As we had a couple of hours to spare before we could check in to our Shinjuku hotel, we headed off for a quick look at the views from the 45th floor of the TMG Building – a popular city viewing site. Unfortunately, a haze of pollution obscured the horizon and Mt Fuji was nowhere to be seen. As we soon discovered, there are not a lot of English or other language translations visible – in restaurants, on ATMs or on train maps. A bit like Australia’s mono-linguistic signage really. Keith Dunstan, well-known Australian author, journalist, columnist and sometime vigneron has died in Melbourne at the age of 88. I was privileged to meet and enjoy a glass or two of wine with him over the years at wine functions. One of his great tales was about the early days of home bottling of wine. As well as I can remember it, back in the 1960s he and a good friend would rail or truck big red wines in bulk from Brown Brothers of Milawa to Melbourne. However, they always had a shortage of used bottles. Keith recalled that his sister lived at the time in swanky St Georges Road Toorak. So, whenever he visited her he would scavenge bottles that neighbours had put out with the garbage. His prize finds were empty bottles bearing the labels of top Bordeaux brands such as Chateau Mouton Rothschild, and premier cru Burgundy such as Clos de Vougeot. So one evening Keith and his friend went to Florentino Restaurant – where BYO was unheard of. They sat down and presented their two bottles – one apparently “metho” and the other French – to the Maitre d’. He, without raising an eyebrow, opened them, gave the diners a taste to see if the wines were sound and proceeded to arrange their dinner. This piece was submitted by an old friend with whom I shared many of the experiences of a long gone Melbourne that he relates below. MF. A late night visit to the father-in-law OBE (Over Bloody Eighty in his own words) recently was reason enough for him to demonstrate his renowned generosity. One attribute in short supply is his ability to differentiate a good wine from a bad one. None-the-less, he always has a couple of bottles in his portmanteau on any visit. 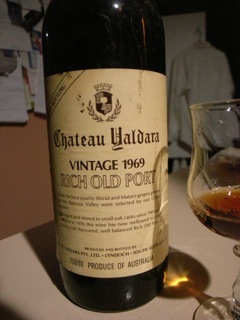 There quickly appeared a Chateau Yaldara 1969 Rich Old Port. [Barossa Valley, shiraz and mataro blend. Back then Australian law permitted the term port on Australian fortified wine]. Aldi Liquor is now selling Australia’s most famous and iconic wine, Penfolds Grange on line. A bottle of the 2008 vintage, rated by Parker at 100/100, will set you back a lazy $649, or $7788 the dozen. With those characters it sounds like a bottle might go well with dinner at a Chinese restaurant.